Whilst on holiday in the US recently and having a lovely browse at the beauty products in a CVS pharmacy, I happened upon one of my most favourite products ever. It's called Noxzema. I was first introduced to Noxzema in 1995 when my sister spent three months studying in Canada and she bought some and decided I would like it too so she brought some back for me. While it's not something that's in the shops here in the UK you can get it from Amazon, so it's worth a search there if you want to try it, or put a order in with the next nice friend who's taking a trip across the Atlantic (I've done this before ...). I'm currently using two other cleansers/face washes at the moment (Nivea and a really nice cleansing foam from Tesco which I will definitely review) and this is now on my bathroom shelf too. I don't use the same ones every day as my skin tends to change regularly so I just pick the one I think will suit it best at the time! 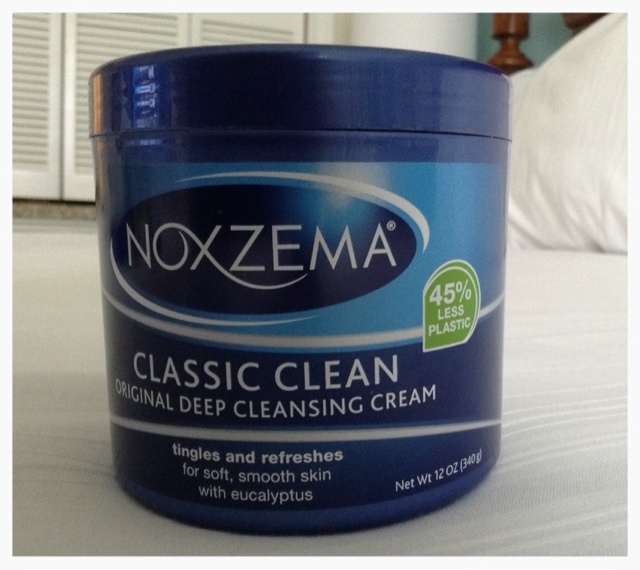 I tend to use Noxzema in the mornings on a make up free face before I get in the shower, it really helps wake me up! Noxzema is a face cleanser that goes really deep into the pores so you do feel like ALL the dirt and make up is completely gone though be careful round the eye area as it'll sting if you scrub too hard at your mascara, it's perhaps best to take off eye make up with remover as we all know the eye area is delicate and worth preserving (I'm over 40, let me tell you, it's worth trying to preserve!). It's quite a funny texture, it has a sort of solid cream consistency but when you rub it into your face it sinks straight in, then you have to rinse it off which leaves your face feeling tingly fresh, it's also got an added moisturiser which is good if your skin can be a bit dry. The scent I can only describe as slightly medicated, to me it smells a bit like it's got tea tree oil in it though I don't know if it has, like everything it won't be everybody's cup of tea but I like it and don't find it offensive. I got a huge tub for $5.99 and the prices on Amazon are just as impressive, about £3.00 (not sure if that includes postage or not). Has anyone else tried this? What do you think of it?